There was only one thing Stinky was afraid of, and that was being stuck in one place forever. He was an adventurer, a traveler, a resident of the world. He wanted to explore the world – the more he saw, the more he wanted to see (if you get his drift). So how does this compare to all of you? All of you who are young at heart, have you ever felt as though you haven’t seen enough? I know I do. When you think about it, the only thing that stops you from doing it is… you! Please don’t get me wrong. We don’t condone irresponsibility. But what we want is to let you know that some things that seem so far out of reach are well within grasp. Put your mind to it, plan, and execute. Excuse our ramblings, they’re just random thoughts. If it does inspire you to do something different, let us know how you go. Take care. I think that out of all the activities Stinky likes, he like water sports the best. There’s hardly a moment where he does not mention ‘the time he went snorkelling’. We hope that you like this picture, and hope you have fun colouring it in! We’ve also decided that we wanted to make things a little more interesting. We want you to show us how well you colour in. Mummies and daddies, we hope you encourage your kids to participate. Please download a copy of our image, have your kids colour it in, and simply post a picture of it on Facebook and tag us. We will then pick one lucky winner and send them their very own Stinky The Pig plush toy. Be creative and colourful kids! And for you grown ups out there, here is the link to the original story! As the title may suggest, holidays are over. Firstly, let us apologise for being absent. We hope that you have all been well. We wanted to write and let you know about some exciting things that are coming this year. Sometimes ideas and goals get left by the wayside when you dont put pen to paper and make them clear. So we thought we would share them with you so that we can remember them, and that you can hold us accountable. 4. 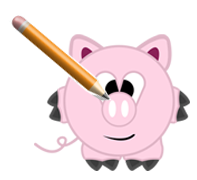 We will publish our first adaptation of Stinky the Pig in Chinese! I know some of the goals listed may seem a little farfetched, but somehow things just seem to work when you put your mind and effort into it. So heres to a fantastic 2015. 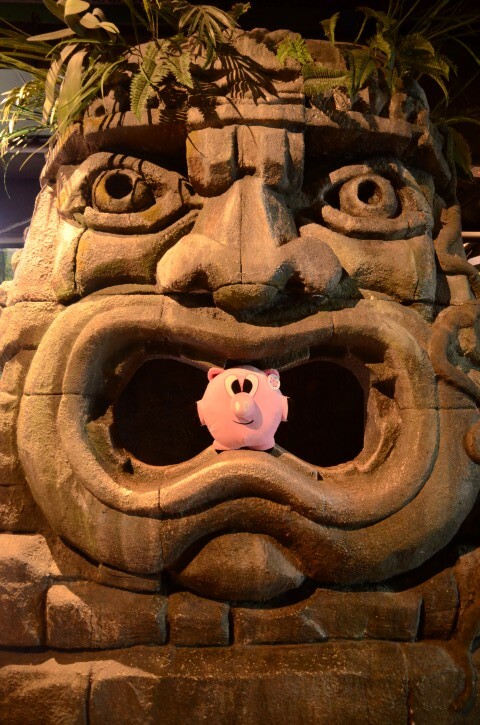 We will make our dreams for Stinky the Pig come true ­ will you make your dreams come true too? Just wanted to pop a quick note from super humid Singapore! I know it is one of my choice destinations when I think of quick getaways. It is a lovely country that embraces multiculturalism and its many associated cuisines. Unfortunately, Stinky did not join me on this trip however, he has been sent on a secret mission to… wait for it… the United Kingdom! Who knows what he will get up to there but as soon as we find out, we will definitely let you know. That’s all from me for now. Stay tuned for a midweek Christmas special! Until then, keep spreading the Stinky love. If you had a chance to get whatever it is that you wish for, what would it be? I know when I think about this scenario, my first thoughts are selfish ones. But when we look at some of the people that changed humanity for the better, you start to realise that they sacrificed self-gain for the greater good of the people. Such men and women are not only capable of being revered during life, but also remembered once they have passed. One great exemplar of this amazing feat is none other than, Nelson Mandela. We have all watched the news and read in the papers that he passed yesterday. All of the current world leaders took some time to remember a man who inspired countless others to love their country and to embrace diversity. It is a hard prayer to preach when everyone around you is telling you that you are wrong. Nevertheless, he kept on doing what he believed was right, until it broke the barriers of hate, greed and race. How many of us can truly testify that we could do the same? I, for one, concede defeat. So when you think about the hardships you endure in your own life, how does it compare to the challenges these past leaders endured? Almost seems miniscule doesn’t it? But that does not discount the pain and hurt some of us may experience when we go through our trivialities. It’s a game of relativity and one we need to master in order to overcome and move ahead in a stronger state of being. So it might be a good idea to put things into perspective when they arise. 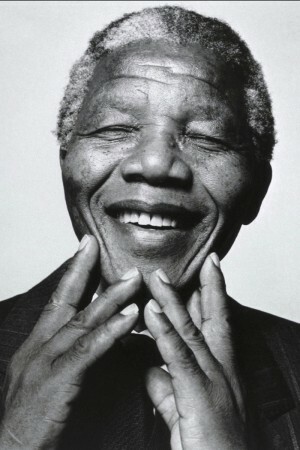 Ask yourself what Nelson Mandela would do in your situation. Ask yourself how you can overcome whatever it is you are experiencing and how you can come out the other side a better person. I’m sure you will find the answer in your own time. These things can’t be taught – they can only be lived. Live, learn, grow. Christmas is almost here and many of us are lucky enough to spend time with our beloved. But I also want to take the time to recognize that not all people have a happy holiday season. To you, I offer you a hug, a smile and my sincerest of blessings for a brighter 2014. New beginnings do not start at the commencement of a new year. They start when you tell yourself you are ready to take the first step. If you need a little push or a little encouragement, I empower you to seek it. If you can’t find it in a friend, there are countless organisations that can assist (eg. Lifeline – www.lifeline.org.au). Reach out because regardless if you believe it or not, there will be a hand on the other side. That’s all from us this week. Stay tuned because many smiles are around the corner. PS. It’s a secret shhhh…..
Hey guys. So we have some bad news for you today. It has come to our attention that one of our friends is in trouble! 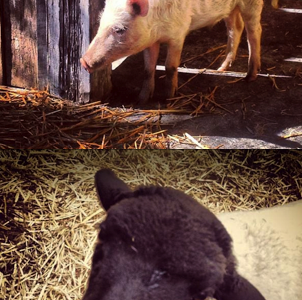 A resident pig named Kevin Bacon at The Grounds of Alexandria has been pig-napped from their premise. This is a serious matter and we would like to get the word out there so that those evil souls who think this is some kind of silly prank fess up! 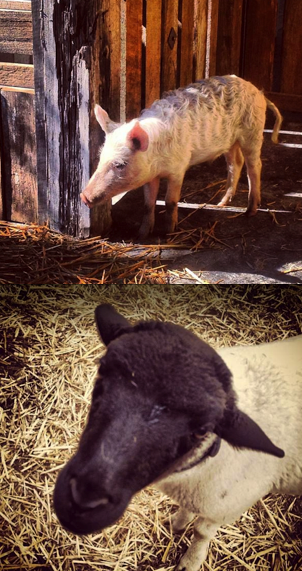 Their beloved Bradley, a pet lamb, was also taken! “We at The Grounds take family very seriously, and unfortunately last night two of our family members were taken from us. Kevin and Bradley are loved by all of The Grounds team and we find it unbelievable that people would take him from us”. Hello everyone. 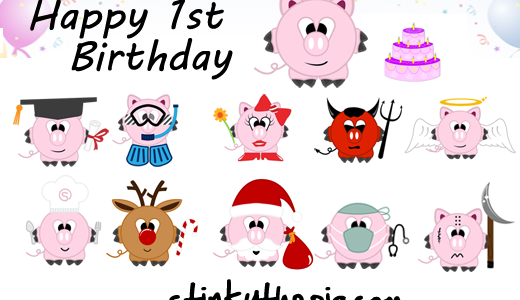 Can you actually believe that one year has passed since we launched stinkythepig.com? It almost feels as though we clicked a button and blinked our eyes and all of a sudden we are one year ahead and ever so grateful for the opportunity to be writing to you. Many things have happened over the course of one year – some we are super proud of and others that provided invaluable lessons to learn from. So let’s talk about some of the milestones during our journey and reflect upon some of them. 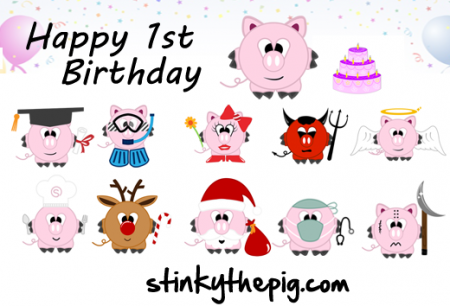 First off the rank was the arrival of our stinkythepig branded t-shirts that featured some of the more popular illustrations of our beloved pig. Although the t-shirts received a lukewarm reception, we promise we will update them in the near future and offer you a more updated and gobbsmackingly awesome range. 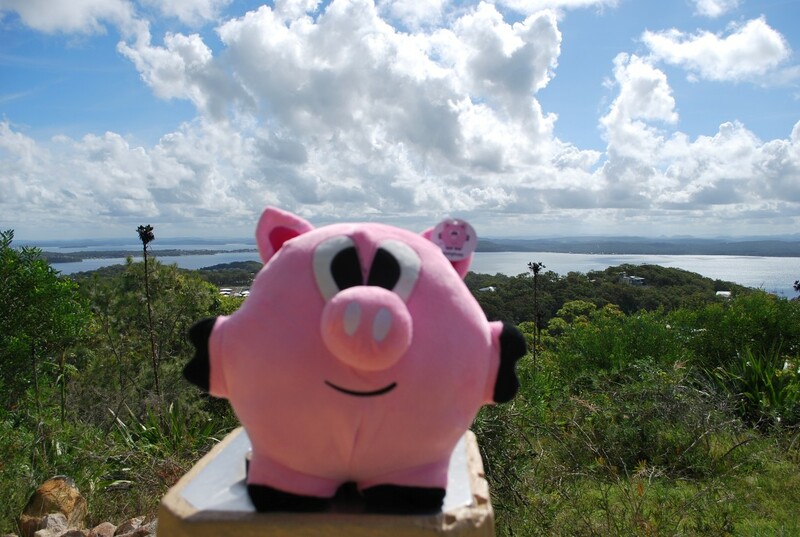 Next, and probably our most celebrated, are our stinkythepig plush toys. Even to this day our plump and soft stinkythepig finds new homes. We truly hope that they make you as happy as they make us proud. To be brutally honest, we thought that having our own plush toy was too far fetched to even fathom. But this is a great example of dreams coming true and hard work paying off. We received so many compliments that we donated a few to a charity:water fund raising event. We also have 10 that we will be donating to a children’s hospital for Christmas this year. We can’t wait to write about it when it happens. We have our HOPE frames as well. I’m going to be a little bias here and say that it still touches my heart each time I look through the magnifying glass and read the side note. It is such a simple concept yet it has a powerful meaning. I still stop and think each time I see the frame I have in my room. Have a read of our post if you have not already done so. That’s all for the physical offerings but we will make sure we let you know when something new is arriving! We’ve posted stories and articles and writings about this that and the other so that you all could immerse yourself in content that was enjoyable to read. Looking back it is hard to believe we had written so much. We like to think that there is a smidgen of something useful in our posts that help you, even in the slightest, to laugh that little bit louder. We have had over 10, 000 visitors and hope that as we grow, our fans grow too. We look forward to another year of excitement and more tantalising tales of Stinky. More importantly, we wish you joy and sunshine and roses aplenty. Here’s to another exciting year to come. Take care all! Imagine you’re in a dark place, unfamiliar creatures lurking about. You watch while they drift by not even noticing your presence at all. Although dark, the place is filled with an explosion of dark tones and tints that it almost seems colourful. There’s some splashing and the cacophonous mumble jumble of water flowing and falling. Do you know where we are yet? It’s ok if you aren’t familiar with the above description. 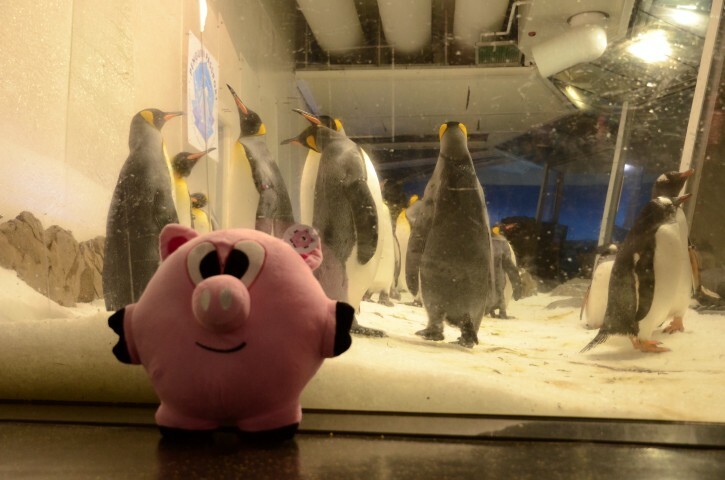 You don’t really find yourself in an aquarium that often… right? 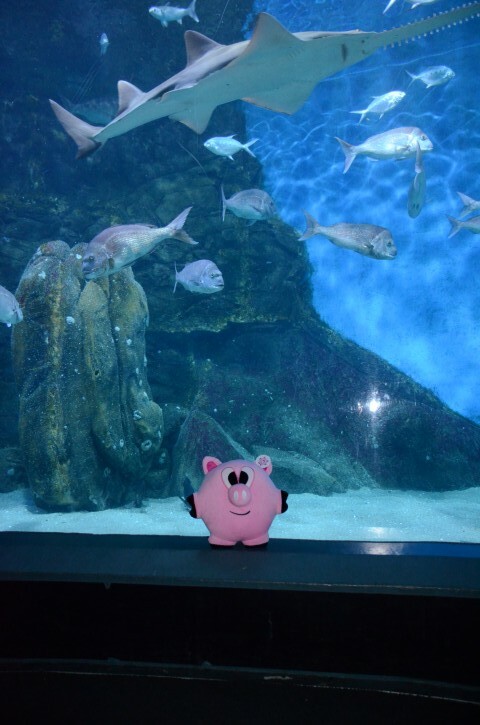 So Stinky made his first visit to an aquarium. Most people would go to an aquarium to see aquatic and marine life. 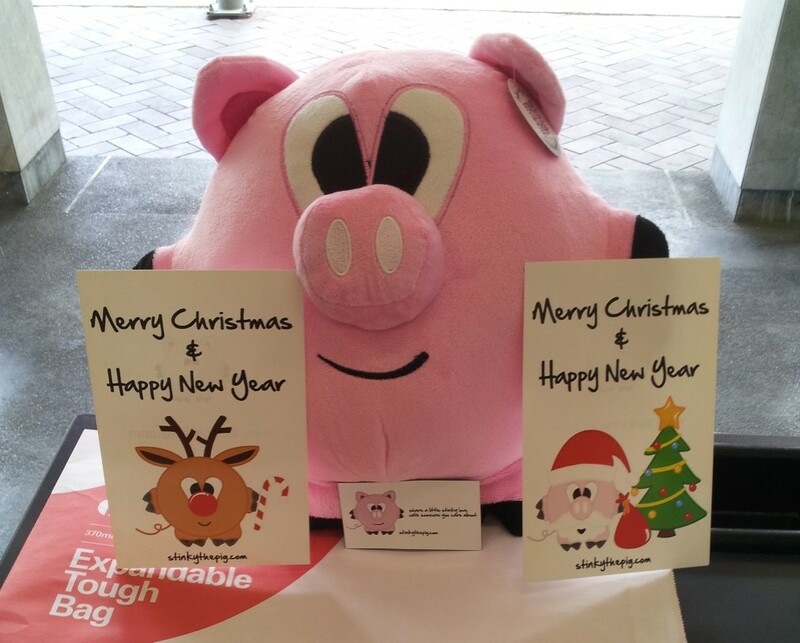 But this time around, they were greeted by a smiling cheery pig! Now that has got to be exciting right? The adventure started off with a bang. When walking in, we were first greeted by a ginormous shark! It wasn’t real, but it almost seemed lifelike – its mouth wide open bearing the full package of razor sharp teeth. If this was an indication of what was to come, then it would surely be an experience Stinky would never forget. As we walked into the aquarium, a colony of emperor penguins said hello. It’s amazing how still they can stand because at times, it almost looked like there weren’t real. A very tame creature that stands tall with dignity. They seem to have a quality that we can all learn from – be proud of what and who you are. That’s something a great many of us can’t seem to get right. There are times where I would wonder if we are as great as we make ourselves out to be. Let’s park this thought for now. We move along and one thing really stood out to Stinky. He remembers snorkeling in the ocean and thought that he had seen the wonders of the water. He hates to think that what he saw was inferior to everything he saw today. But the thought did cross his mind. And to be honest, we tend to behave like this in all matters as well. We always come across things that are bigger and better in our journey. Sometimes we look back and think that the things we had in our past resemble a drop of water in an ocean. But we also forget that it’s the experiences we have – big or small – that make us who we are. So never discount the once significant things in your life. As we make our way down some ramps, we begin to see the light of day fade away. The light becomes bluish and the jitterbugs start to take over. We make our way deeper and deeper until we walk right into the middle of a humungous tank. As we pick our jaws up from the floor a manta ray glides above us, while its shadow swallows us for mere seconds. There are fish. There are rays. There are… SHARKS! Oh what a sight they were. Stinky couldn’t believe his eyes. 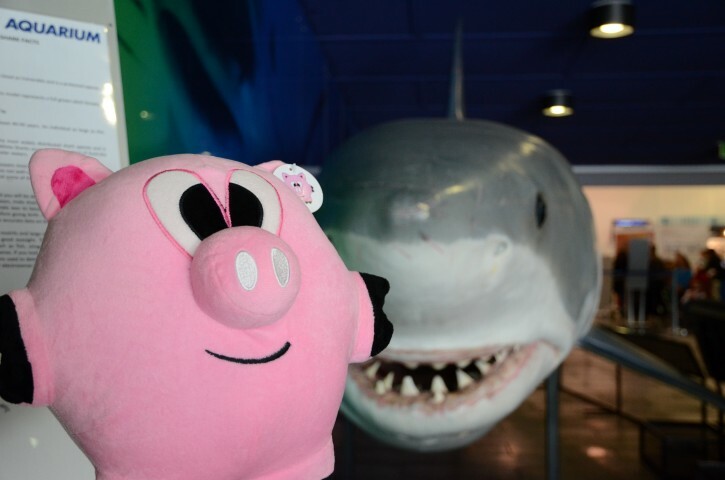 To think that the only thing separating Stinky and the sharks was only a piece of Perspex glass! So we sat there for quite a long while watching the marine life gracefully swim about in their serenity. It is quite amazing how they all get along and just respect one another’s space. 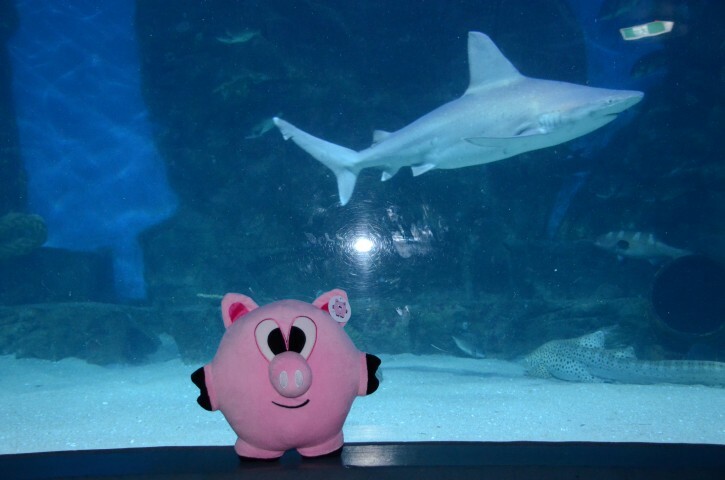 Stinky started to realise that sharks weren’t as aggressive and maniacal as the shows on TV made them out to be. Yes, they do possess and aura of supremacy. But they don’t go around bullying other fish just to show them that they are great. It’s a good reminder to be humble… whoever you are. Whether you are a powerful CEO or the leader of a nation, it’s a stark reminder that being humble is a quality that will earn more respect than if you were to be a power pusher. We sat, we watched and then an announcement came on advising the aquarium was due to close. We didn’t want to leave such a relaxing and magical place. Eventually, we made our way out. It would be another experience Stinky would never forget. It really is true that life is not measured by the amount of breaths we take, but truly by the moments that take our breath away. Go forth and make these moments for yourself. Trust us, you won’t regret it.